This post is sponsored by Safari Ltd. Thank you for supporting the brands who support this blog. Two years ago, I graduated with a degree in elementary education. I am very passionate about teaching Aimery through using STEAM learning as I believe it’s important for early childhood development. He is currently going to a preschool that focuses on STEAM learning, and we also focus on it while at home. We recently gave Aimery new toys from Safari Ltd that encourage hands-on learning while playing. We as parents want to give their children the best form of education, and the perfect time to start is now! STEAM learning is something that can be done at home, and it allows all parents to help create that bright future for their children that we all dream of. Keep reading to learn more about STEAM and how you can best practice with your toddlers! STEAM learning is a form of education that focuses on five principles represented in the acronym. It’s a hands-on way of learning for children and includes the following activities in its curriculum: Science, Technology, Engineering, Art, and Mathematics. Initially, this was called STEM but recently art was added! Helping your toddler learn new things allows them to grasp concepts better. Aimery and I love to play with hands-on toys like his favorite life-like flying squirrel. Not only is playing with your child fun, but it also helps develop a better parent-child relationship. It’s so important that we, as parents, create a safe environment for our toddlers to play and explore using of their senses! The first thing you should encourage in terms of STEAM learning is allowing your toddler to be himself. Does your child love art at the moment? Can he sit down for hours playing with animal toys? Your toddler is his own person and will have varying interests week by week. Encourage whatever he is interested in and make it a learning opportunity! The awesome thing about STEAM learning is that it naturally fits toddlers, in their manner of play and nature of curiosity. All we have to do is provide the materials, opportunities, and experiences for our little ones to explore! 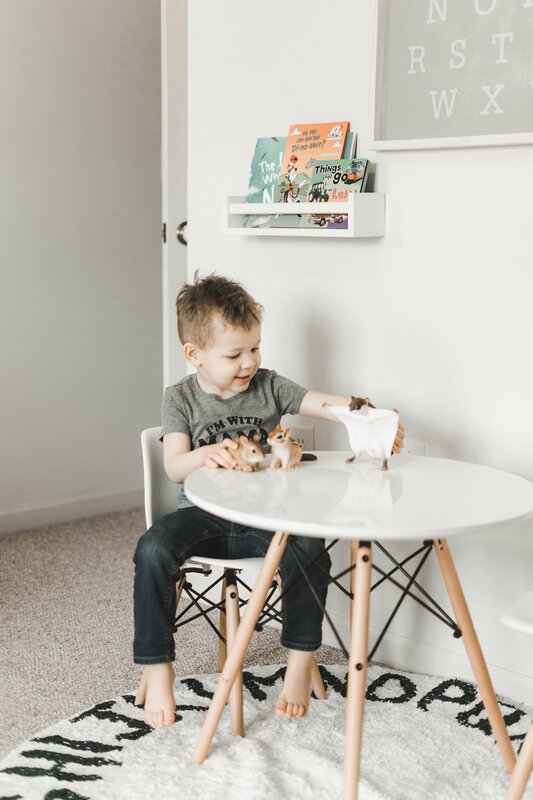 The best ways to practice STEAM learning with your child is through providing a safe environment for your toddler to explore, allowing him to ask questions, and by exploring with your toddler to create a good relationship! We recently got Aimery these amazing life-like toys from Safari Ltd. For over 35 years and three generations, Safari Ltd. has been fostering curiosity, conservation, and imagination in children around the world. They design and manufacture educational toys that allow children to learn through STEAM from dinosaurs to sea life, and from wild life to fantasy and mythical creatures. I love that they are a family-run company who genuinely want to bring children joy while promoting education and environmental awareness along the way - all things that we promote in our home! Safari toys help children learn every subject, from science to math! Safari Ltd® gives children the opportunity to use their imagination while promoting creative thinking. They recently created SafariPedia®, an online learning center where children can read about all of their favorite Safari animals online. And the best part? Safari Ltd® has given back over $100,000 so that tomorrow’s children have the chance to share our love and respect for the natural world. You can get 20% off your first order by using the code SummerShores1 here. Aimery loves to use his imagination while playing with his favorite animals, and I love that he is learning through STEAM! The hands-on learning that Safari Ltd gives Aimery makes me feel confident that he is developing well and learning through play. It’s so important that we encourage STEAM learning activities with our children! How do you encourage STEAM learning with your toddlers? Comment below!